Tiffen has introduced a pair of filter kits for videographers using the DJI Osmo Pocket that the company says help to create a more cinematic look to the footage recorded with the device. The kits consist of neutral density filters to control the shutter speed of the Osmo and polarisers to assist with color saturation. A three-filter kit has ND4, ND8 and ND16 filters, each with a polariser built in, while the six-filter kit offers the same three ND/PL filters minus the polarising element. Tiffen says the filters are coated to prevent moisture sticking to the surface and to protect against reflections and scratches. The optical glass has a 10-year warranty, and a metal case is provided to store them in. The 3-filter Osmo Pocket Filter Kit costs $49.99 while the 6-filter kit is $79.99. For more information see the Tiffen website. I wish all of these manufacturers would sell a clear one for protection when used on a fast moving vehicle. Is ND16 dark enough for bright scenes like beach? I guess the preferred shutter speed is around 1/30. It does 4k60 but even at 1/120s it's at least 2 stops overexposed. You're right - for beach you would want stronger filter. I had to use an ND64 last week with the Osmo Pocket in sunny conditions and shooting mid-day in Las Vegas. I was shooting 4k60 at 1/120 sec. shutter speed. How do these Tiffen filters go on the OSMO? Magnetic or adhesives? 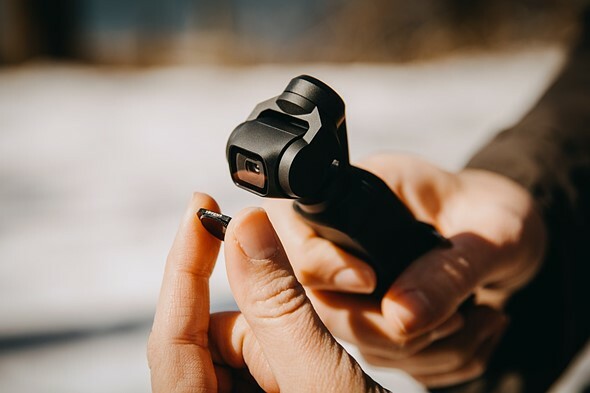 That DJI Osmo Pocket looks really cool and fun to have. But I know myself. I would play with it for a week, set it down somewhere around the house, then never even look for it again. I've had my Osmo Pocket for two months and we are still on our honeymoon! I just spent a few days in Las Vegas and the Osmo Pocket was always in my possession. The portability and convenience of the Pocket Osmo is awesome! The Osmo Pocket DOES actually fit in your shirt or pants pocket. By the way, I use the below filter set, which are attached to the Pocket Osmo via magnets. It is best for shooting video when moving, and really fun to use. Buy it, you will enjoy it! I fly RC airplanes and the Osmo Pocket mounted on my hat does a decent job of capturing my flights. See recent video below. It's great to use, I bought it especially for my wife to film our one year old, easier to use than a mobile phone and the stabilization and portability are amazing.